Sherlock Holmes, and its sequel, Sherlock Holmes: A Game of Shadows. In this Victorian-era story, Holmes is played by Robert Downey Jr., while Watson is portrayed by Jude Law. Holmes is very eccentric here; but then, he always is. Holmes’ defining trait in the movies is his knack of thinking multiple steps ahead, something audiences experience along with him. So, for example, when he’s about to fight someone, the scene is played out twice – once in his head, and once in reality. Watson is along for the ride, for better or for worse. He’s a great reluctant companion, aiding Holmes when necessary, bickering with him all other times. The BBC’s modern-day version, Sherlock. 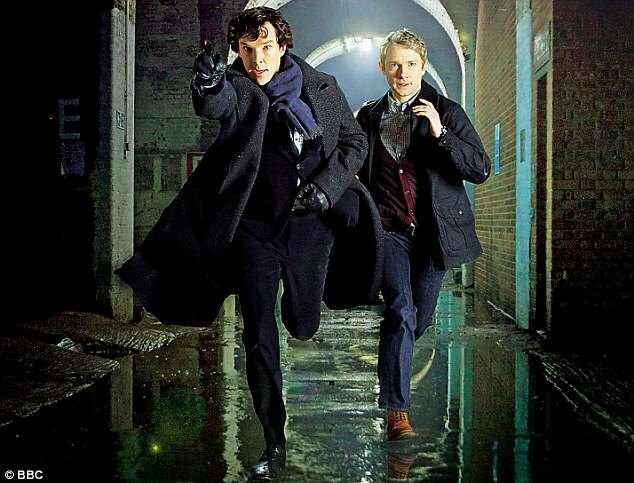 I’m currently slightly obsessed with Sherlock, due to its utter brilliance and general amazing-ness. Sherlock, played by Benedict Cumberbatch, is something to behold. He picks up on the slightest details, reading a person’s history from his clothing, body, and/or possessions. He’s a modern eccentric, a genius, aloof, and doesn’t quite know (or care to know) how to act towards other people. When another character on the show calls him a “psychopath,” Sherlock responds, “Not a psychopath, I’m a high functioning sociopath, do your research.” Except he says it with a British accent, so it sounds even better. And then there’s John, whom I’m absolutely in love with. Interestingly, he’s still an ex-soldier returned from Afghanistan, like in Arthur Conan Doyle’s original stories. In contrast to Watson of the movies, John likes being caught up with Sherlock. Though he gets frustrated with the consulting detective (and who wouldn’t? ), he thoroughly enjoys their adventures together. John gets Sherlock in a way that no one else does, and Sherlock gets him too. I love their bromance. They admire one another and are loyal to each other, which says something about Sherlock, who has never previously kept up a relationship in his life. Sherlock’s only downside is that the show is divided into three episodes (each 90 minutes long) per series, much too few for my liking. Apparently, there’s some CBS version of Sherlock Holmes in the works, called Elementary. It’s like Sherlock (set in the 21st Century), but American. Really, I don’t know why they’re wasting time, energy, and money trying to remake an already brilliant show. Have you watched any of these? All of these? Like ’em? Hate ’em? Lemme know in the comments! PS Check out Arthur Conan Doyle’s lesser known book, The Complete Brigadier Gerard. It’s hilarious and wonderful. hello…. I’m also a big fan of Sherlock TV series. I just made a blog post about that and in the recommended links your blog came up. It’s nice no meet a person sharing a common interest. It’s always nice to meet another Sherlockian. You might be interested in checking out http://www.tumblr.com/tagged/sherlock – you’ll find pics and gifs there posted by other Sherlock fans. Enjoy!